Is there a right time to benchmark? While benchmarking clauses may be built into a contract, it is best to align benchmarking with concrete objectives throughout the sourcing journey. With the digitization wave disrupting and redefining today’s businesses, the role of enterprise IT, and consequently that of the IT Strategic Outsourcing and Vendor Management (SO&VM) function has become more critical than ever before. As enterprises ramp up their digital transformation initiatives, the IT SO&VM function faces the onerous task of establishing and orchestrating an IT services vendor portfolio that can help the enterprise navigate the proverbial IT maze and fulfill strategic business objectives. However, this is clearly easier said than done from an strategic outsourcing & vendor management function standpoint. Current enterprise satisfaction with their incumbent IT service providers stands at an all time low – 54% of all enterprise discussions conducted by Everest Group over 2017 (with companies nominated as reference clients by service providers across multiple PEAK Matrix™ evaluations of Everest Group) expressed dissatisfaction with IT service providers. A careful examination reveals that a large part of the enterprise dissatisfaction with providers is associated with a perceived lack of innovation and business value within the IT services engagements. While enterprises point out that service providers are largely at fault for this phenomenon, Everest Group’s research suggests that the fundamental challenge lies in the sourcing model and associated practices itself. The current IT services sourcing model is designed with scale and cost effectiveness as the primary objective function and vendor selection/categorization premise. However, new age IT services delivery requires service providers to be properly incentivized, and equipped with sufficient enterprise context in order to drive business value from IT. 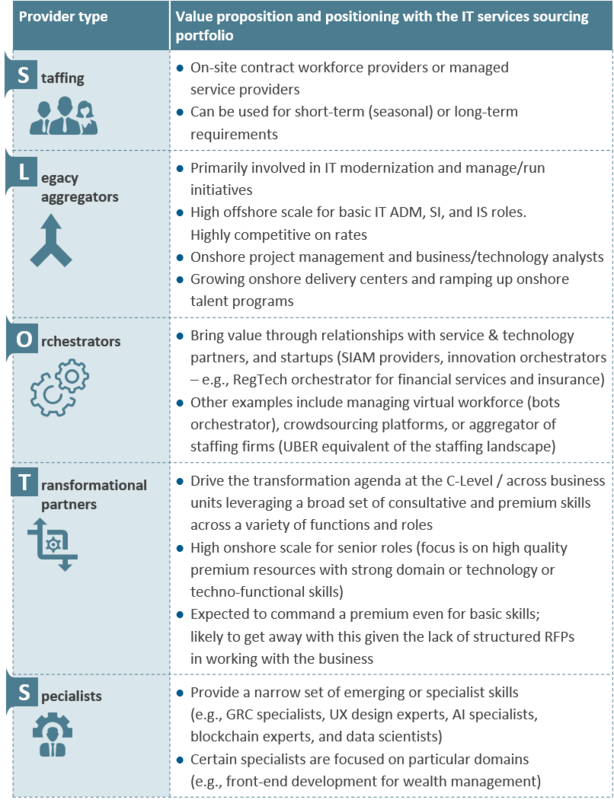 Broad recommendations around dealing with the evolving IT services sourcing landscape. In today’s digital world, the value of enterprise IT is being defined by its ability to accelerate time to market, foster business innovation, and help drive competitive advantage. a “technology-first, automation-led” modernization approach, given the maturation of arbitrage-led models. 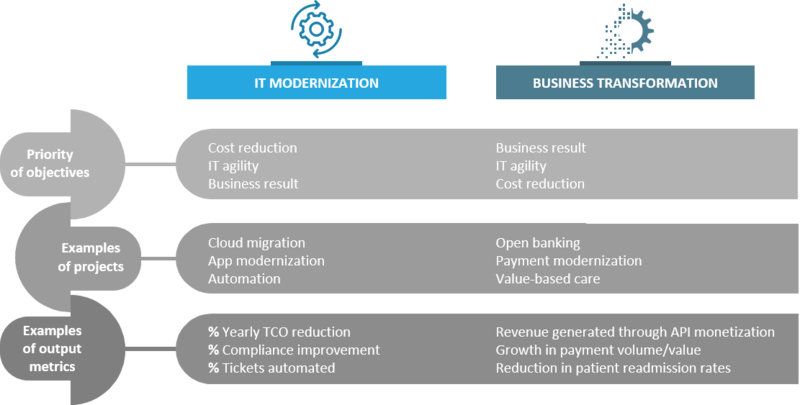 It is imperative that enterprises strike an optimal balance between their business transformation and IT modernization initiatives to maximize business value from IT. The role of enterprise IT is undergoing a sea change, with businesses across the board being disrupted and redefined by the rapid digitization wave. IT has now evolved from being a mere cost center to a critical business enabler – in fact, about 60% of enterprises have prioritized IT services agility and flexibility through digital transformation as the PRIMARY focus of their IT services strategy, with cost reduction seen as a logical/implicit derivative. The digital paradigm has given rise to two distinct sets of enterprise initiatives – IT modernization and business transformation. IT modernization at its core, is focused on making IT leaner, more cost effective, and align better within business requirements. On the other hand, business transformation initiatives are designed with the desired business impact as the starting point, with a view around how “fast” business outcomes/results can be achieved (with cost not necessarily being a key consideration). IT service providers stand to play a key role in helping enterprises navigate the myriad of complexities arising from next generation technology adoption. However, current enterprise satisfaction levels with IT service providers are at an all-time low. Many enterprises believe that IT service providers simply lack the strategic focus and innovation mindset to drive business value within engagements. However, enterprises are equally at fault – current enterprise IT service sourcing strategies and constructs being followed by SS&VM functions are still anchored to traditional, cost-centric frameworks, leaving limited room and incentives for service providers to think out-of-the-box and drive innovation on a consistent basis. 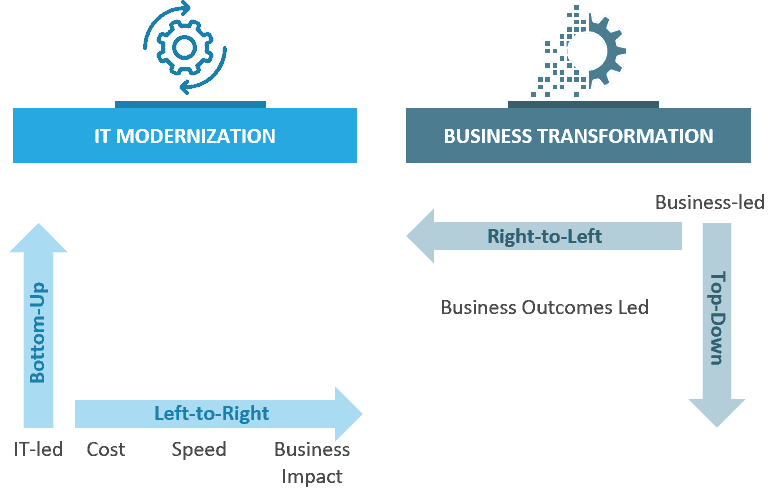 While both IT modernization and business transformation are geared towards driving business value, the initiatives fundamentally warrant different approaches and evaluation metrics. While cost reduction and resilience are critical considerations within IT modernization initiatives, digital transformation is designed with the premise that business results and speed-to-market are of paramount importance. In IT modernization, activities include formulating a legacy automation and cloud strategy and moving into a hybrid environment. Examples of focus areas include how to engineer that IT to be more cost-effective, which workloads should be moved out of legacy into the cloud, and which workloads should be developed in the cloud versus the legacy environment, and what workloads should be automated. On the other hand, activities in a business transformation initiative focus on rethinking all service model components. These include, for instance, technology and architecture, development process and methodology as well as the talent model of using a persistent team collocated with the business. That said, these planned spend commitments with IT service providers do not necessarily imply enterprise satisfaction within existing sourcing arrangements. In fact, anti-incumbency sentiments are at an all-time high within IT services engagements. The expectation mismatch between enterprises and their IT service providers is evident from the fact that every one in two enterprises is currently dissatisfied with in its ongoing IT services sourcing engagement. This dissatisfaction is even more profound when a “digital” lens is applied to the sourcing scope and construct. Contrary to enterprise perception, a meaningful proportion of dissatisfaction arising within IT services engagements is attributable to existing gaps in the sourcing model design itself, as opposed to solely being a function of service provider capabilities and performance. 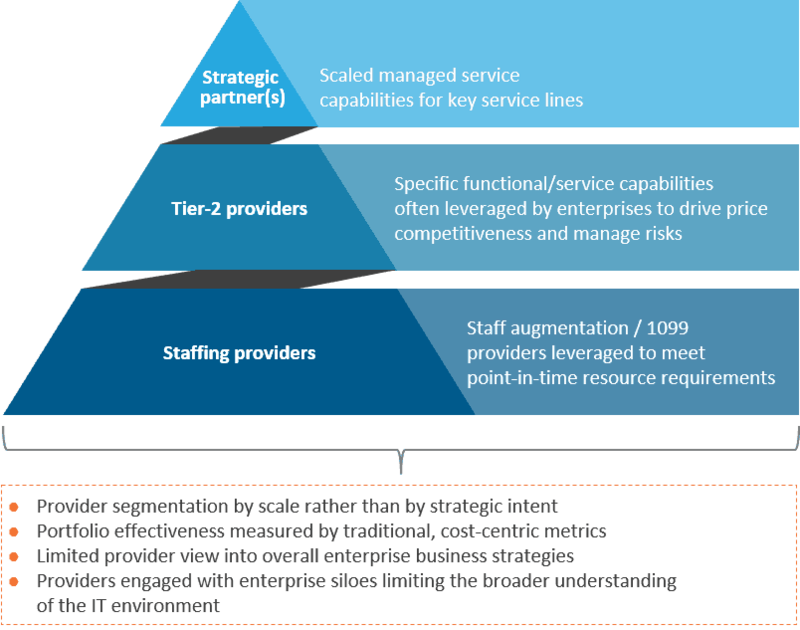 The current model of vendor selection and sourcing for IT services largely follows a traditional three-tier model comprising strategic, Tier-2, and staffing/1099 vendors. The key challenge with this vendor sourcing model is that it has been designed for driving a scale-driven, arbitrage-led IT services strategy, rather than being anchored to a well-formulated strategic intent that is geared towards creating business value on a continual basis. One of the underlying drivers for the decreasing relevance of the traditional sourcing model is the impact of enterprise digitalization on the IT+Ops organization and consumption. IT modernization initiatives require service providers to possess sufficient context around how the end-to-end IT stack is architected in order to build a transformation roadmap that not only drives cost savings, but offers the desired level of performance and resilience. plug-and play access to ecosystems. This requires a corresponding change in sourcing models to help drive shorter, quicker, and business-focused outcomes at scale, while ensuring that providers have adequate investment and skin in the game. of the increasingly contingent labor ecosystem and the proliferating technology landscape. 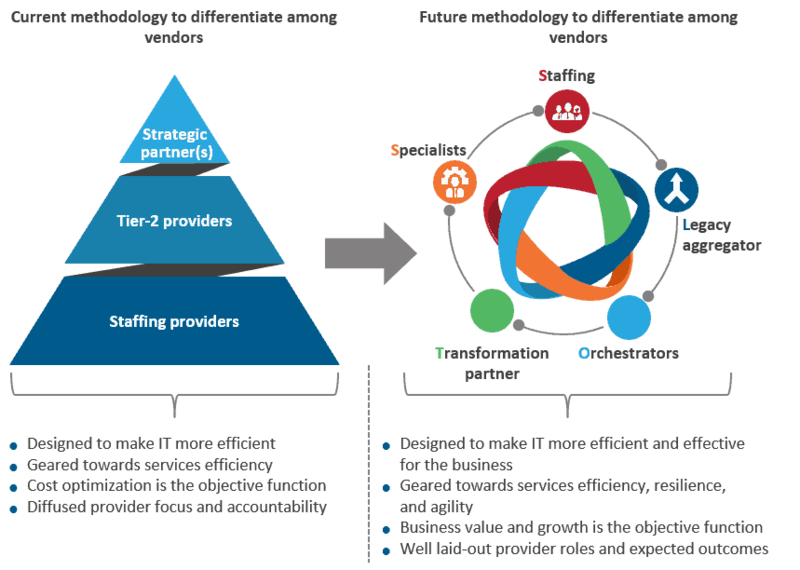 The SLOTS framework is aimed at pivoting the IT services sourcing portfolio design and selection to a “value-driven” provider model, from the classical “scale-driven” vendor categorization followed within traditional sourcing practices. The underlying principle of the SLOTS framework is that deriving business value from IT requires enterprises to have access to best-of-breed capabilities across a broad set of themes such as legacy IT estate optimization, next generation technology implementation, domain-centric business transformation, multi-vendor orchestration, and niche/specialized functions (e.g., design, data). 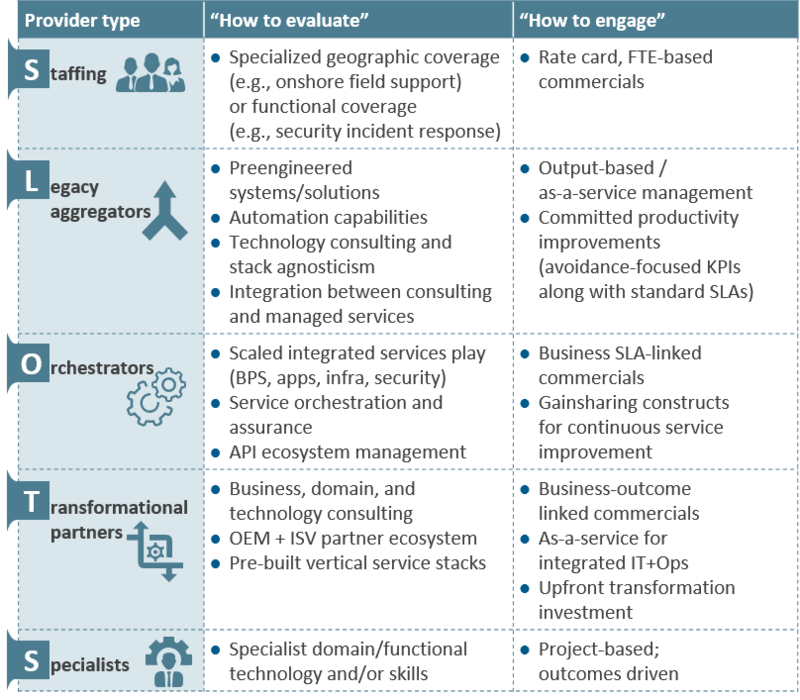 Each provider category within the SLOTS framework is expected to bring in a unique set of value addition elements that help enterprises deal with the complexities arising from contingent labor ecosystems and rapid technology proliferation. Barring multiple domain-centric / functional specialists, an ideal and balanced enterprise IT services sourcing model will include an optimal number (one to two) of providers identified to play each of the roles in the SLOTS framework (thereby avoiding provider sprawl, mitigating governance complexities, and driving high accountability). Furthermore, as enterprises progressively traverse the journey towards IT modernization, the role of legacy orchestrators is gradually expected to metamorphize into that of orchestrators providing ongoing governance and driving continuous improvement. The IT services outsourcing market is an inflection point – while the “traditional” IT services industry (accounting for about three-fourths of the market) is shrinking, demand for “digital” services (accounting for remaining one-fourth of the market) is ramping. In a hyper-competitive market, only those service providers who can rapidly rotate and align their portfolios with the digital-first world will survive. Capital markets BPO (Business Process Outsourcing) is one of the fastest growing industry-specific verticals within the BFSI segment, with a market size of over $2 billion in 2016. Investment banking is the largest line of business within the capital markets BPO. Asset management, custody and fund administration, and brokerage are the other key lines of business in this space. Enterprises typically look to partner with third-party pureplay service providers such as Cognizant, EXL, Genpact, Infosys, and TCS to remain competitive in the marketplace, and simultaneously manage their regulatory, risk, and cost concerns. But the BPO majors are facing stiff competition from specialist capital markets BPO providers such as Avaloq, eClerx, and Xchanging, which are more focused and have deeper domain expertise. Against this backdrop, what pricing considerations should enterprises take into account when selecting a specialist or a pureplay Business Process Outsourcing provider? Specialists come at a premium: Specialist providers typically charge a premium price. The premium is nominal for low complexity processes such as static and dynamic data management, client onboarding, low value reconciliations, trade capture, and exception matching. Yet, it rises considerably for high complexity capital markets BPO processes such as OTC derivatives, syndicated loans, and alternative investments. Specialist capitalist providers’ expertise in niche and complex services gives them significant pricing power leverage over pureplay BPO providers. Pureplay BPO providers on the move: However, pureplay BPO providers over the last couple of years have moved swiftly, and gained meaningful ground in terms of building competence in high value services. This increased, more head-on competition has reduced the pricing differential to some extent. Pricing model induced rate differential: FTE-based pricing is most common in capital markets BPO contracts, closely followed by the transaction-based model. Typically, contracts with transaction pricing have a higher Annual Contract Value (ACV) per FTE, as the service provider agrees to share some of the buyer’s risk, and thus bakes the risk premium into the pricing. Additionally, the scope of work for capital markets BPO deals with transaction-based pricing is usually higher value and more complex, pushing up the average ACV per FTE further. Net-net, specialist providers, which at least as of today handle more high-value services, come at a higher price than their pureplay BPO peers. And, at least as of today, buyers appear ready and willing to pay this premium. Enterprises in this space typically tend to value and favor specialists when it comes to finding a partner for their capital markets BPO operations. And they tend to be particularly selective, as most service providers – both pureplay and specialist— do not play in all the segments, but instead focus on building deep capabilities around one or two of the four key business lines. Are you working with a pureplay or specialist provider in the capital markets BPO space? To what extent did pricing play into your provider selection? Do you think specialists have an edge over pureplay BPO providers in terms of capabilities? The engineering services industry is one of the most interesting segments in the global services landscape today. Compared to IT and business process services, the global engineering services market is much smaller, at approximately US$ 90 billion. It is also growing much faster, at approximately 15 percent per year. The bulk of the growth is going to be driven by a need to reimagine global sourcing of engineering services, in line with the progression of enterprise digitalization strategies. Crushing spend: Arguably, there’s nothing new about leveraging a global sourcing model to reduce spend. However, the optimization levers go well beyond arbitrage, extending into the realms of analytics, the IoT, and automation. We are beginning to see enterprises contracting not just for cost savings, but for specific details around how cost savings are being achieved (e.g., success of automation projects, and ongoing commitment for automation.) Digitalization can often achieve breakthrough spend reduction outcomes (e.g., maintenance of oil refineries leveraging IoT technologies), well beyond the traditional arbitrage levers. Transforming experience in plants or mines: The experience is typically optimized across a bunch of typical considerations such as safety and accessibility, speed, and convenience. For instance, using design thinking principles in plant assembly line design, IoT implementation in mines for health and safety related use cases and medical device companies are using digitally reimagined techniques to create improved patient care outcomes. Disrupting the business model: Business model disruption comes about as a natural progression through the first three levels of the hierarchy, coupled with a disruptive idea. For instance, automotive companies the world over are waking up to the potential of a new business model that is built on asset sharing as opposed to asset ownership. Utility companies are creating parallel energy sharing models using blockchain. Medical diagnostic companies are reimagining their business model by experimenting to service-led, as-a-service models. Evaluate the current state of your digital engineering journey against the strategic objectives of efficiency, experience, innovation, or disruption. The way you measure success in the short term should derive from where you are, and your longer-term strategy should stem from a broader industry vision. Evolve the ER&D sourcing model in line with your aspirations. If you are trying to drive strategic business impact at the higher reaches of digital engineering maturity, you should be able to use objective data to benchmark the impact on business processes. For instance, your ER&D sourcing models should be linked with improvements in supply chain metrics, experience, accelerated time to market, or an increase in digital-led revenues. Enrich the sources of engineering and R&D innovation by engaging with service providers, start-ups, academia, designers, social scientists, etc. Such an ecosystem should transcend the traditional enterprise-partner model, and requires a central orchestration function for scalability. Visit our engineering services page for more insights on engineering services global sourcing strategies. The global pharma industry, hit hard by the rise of generics and the patent cliff on branded drugs, has been in cost-cutting mode, especially since the beginning of this decade. With the rising costs of R&D and new drug development, pharma corporations began looking at streamlining manufacturing operations through Contract Manufacturing Organizations (CMO) and de-risking their R&D efforts via Contract Research Organizations (CRO). CROs, which were initially sought out by pharma companies to cope with ad hoc/transient requirements such as additional capacity, have now emerged to cater to a whole host of services in the pharma outsourcing construct. These include clinical trial management, clinical data management, medical/clinical writing, bio- statistical programming, pharmacovigilance, and regulatory report writing. Offshoring has also gained considerable traction in the last few years. Indeed, many global pharma giants have increasingly looked to low-cost locations such as India, as evidenced by the establishment of various home-grown CROs and Indian arms of global CROs, and some Tier 1 Indian BPO providers’ scaling up their capabilities in this space. Given their nature and complexity, pharma industry processes typically command a substantial FTE cost premium over judgment-based sub processes in functional areas. For example, the following chart compares Clinical Trial Management FTE costs within those in Financial Planning and Analysis and Procurement Outsourcing. What’s behind these premium prices? Skill profile: Even in the fairly early stages of outsourcing, pharma companies entrust some of their core work, such as clinical research, pre-clinical trial management, and certain activities in drug discovery, to their service providers. The necessary niche skill-sets typically require a background in clinical research, medicine, biotech, etc. Thus, the FTE rates are higher than those for even highly educated business analysts. Nature of deals/projects: Pharma projects are relatively shorter in tenure than those in other BPO functions, especially deals involving medical writing and bio-statistical programming, where average tenure may range from four to eight months. Thus, the average utilization is significantly lower. This lower hour base to recover costs/margins leads to a higher hourly billing rate. Service provider margins: While the highly mature and commoditized F&A, HR, and Procurement outsourcing markets have margins in the 10-20 percent range, pharma BPO is still relatively nascent and thus commands margins of25-50 percent. Technology cost: In some deals, we’ve seen pharma BPO service providers bearing the cost of technology licensing, which further increases the FTE pricing. We expect that pharma BPO will likely continue commanding a premium pricing compared to other BPO functions for two key reasons. First, pharma companies are gaining increased confidence from strengthening clinical and medical infrastructure and the stabilizing regulatory and business environment in India. This is resulting in outsourcing more core activities such as the entire spectrum of services pertaining to drug discovery and development. And second, Indian CROs and BPO providers are augmenting their capabilities to move beyond pharmacovigilance, bioequivalence, and bioavailability services, and challenging global CROs in areas such as end-to-end drug discovery and product development. What’s your take on the premium pricing in the pharma BPO industry? Is it justified?